Hot Mama In The City: Canticos. Vamos a Cantar! Vamos a cantar! 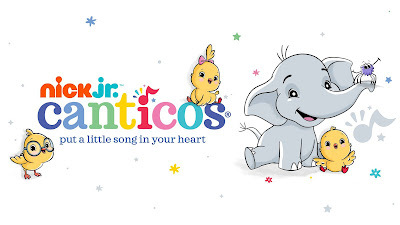 Nick Jr. wants to put a little song in your heart and help celebrate Hispanic Heritage Month con Canticos. Available on the free Nick Jr. app, Canticos features bilingual nursery rhymes. A place where children can learn classic nursery rhymes in both English and Spanish. These educational videos feature adorable animal characters that will teach kids simple vocabulary words, numbers, days of the week, and more in both languages. Where was this content when my little ones were learning nursery rhymes? Raising bilingual children isn't easy and Canticos can make your kids learning Spanish a bit easier. When my children were younger they watched a lot of Nick Jr. I love the diversity of the shows and characters. Nick Jr. helped expose my children to different languages and cultures. As a Latina I’m happy to see more bilingual and educational shows. The creators of Canticos are on a mission to ignite and advance creative thinking through storytelling and the power of play, and they do so by remaining dedicated to telling authentic, relevant stories that come from their personal experiences with these songs. When my children were younger we would often sing 'Twinkle Twinkle Little Star' together. It's one of my favorites from my childhood. I know someday my children will sing it to their children someday, and hopefully in both English and Spanish.